A sovereign wealth fund (SWF) is a state-owned investment fund that invests in both real and financial assets, including stocks, bonds, real estate, precious metals, and alternative asset classes in furtherance of its home country's strategic, long-term priorities. SWFs are usually established using balance of payments surpluses, official foreign currency reservoirs, proceeds of privatizations, government transfer payments, fiscal surpluses, and/or receipts from commodity exports. There are five broad classifications of SWFs: stabilization funds, savings and future generations funds, pension reserve and future liabilities funds, reserve investment funds, and the most prevalent, strategic development sovereign wealth funds (SDSWFs). 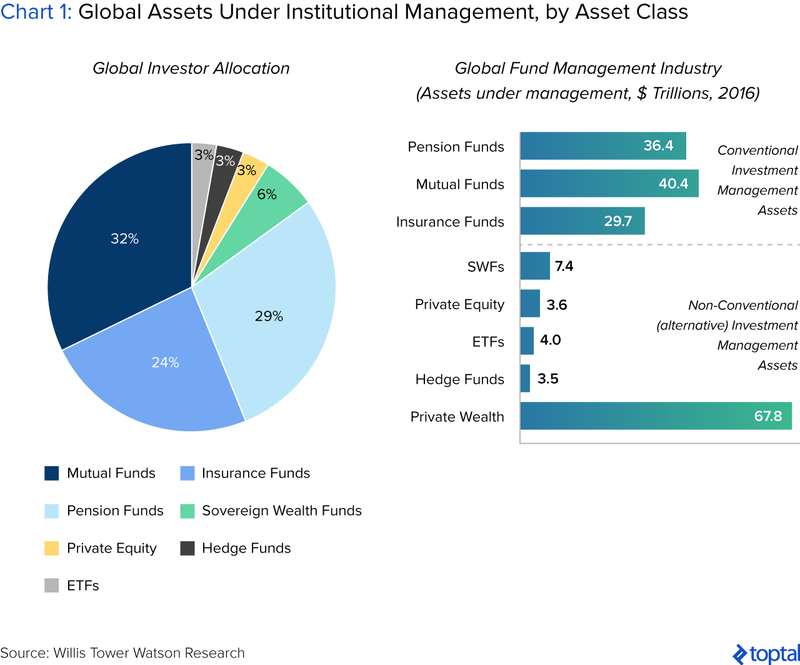 As of 2017, the SWF asset class combined to hold over $7.4 trillion in assets under management (AUM) across 120 funds. The Santiago Principles consists of 24 generally accepted principles and practices voluntarily endorsed by the members of the International Forum of Sovereign Wealth Funds (IFSWF). They were established to promote transparency, good governance, accountability and prudent investment practices while encouraging a more open dialogue and deeper understanding of SWF activities. Established in England in 2009, the IFSWF is a non-profit international group of 30 sovereign wealth fund managers who collectively control 94% of sovereign-wealth AUM. The Santiago principles were established in response to global investors, governments, and regulators who expressed concerns about the asset class' inadequate transparency, independence, and governance practices, given its growing influence within the greater capital markets and investment landscape. 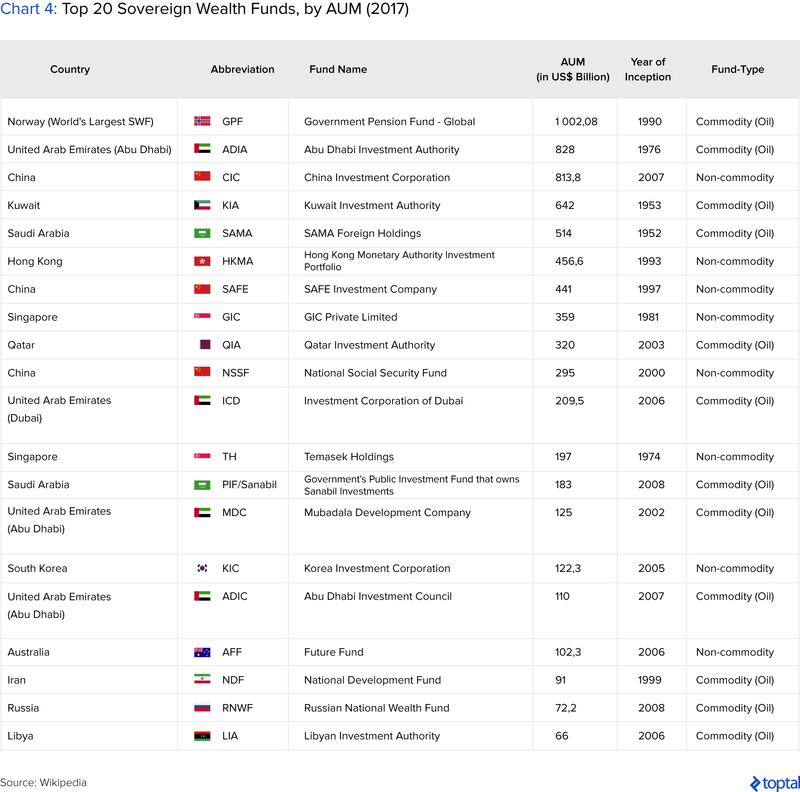 What is the purpose of a Sovereign Wealth Fund? The purpose of a sovereign wealth fund is to deploy dedicated, state-owned pools of capital across global markets and asset classes in furtherance of a country's strategic, economic, or social priorities. These priorities include a stabilization priority, established to insulate a given economy from internal and/or external shocks; a capital maximization priority, which might be focused, for example, on transmuting a given country's natural resource wealth into longer-duration financial instruments for future generations; and strategic development priority, typically focused on propagating development priorities such as job creation, infrastructure development, or economic diversification away from a single commodity. Sovereign wealth funds typically allocate their assets across four investment classes: (1) cash and equivalents; (2) fixed-income securities; (3) global, public equities; and (4) alternative investments, which include direct/private equity, venture capital and hedge fund, real estate, and infrastructure investments. SWFs' portfolio mixes are driven by the underlying economic and strategic priorities of their host governments, of which there are the three mentioned above: (1) stabilization, (2) capital maximization, and (3) strategic economic development. 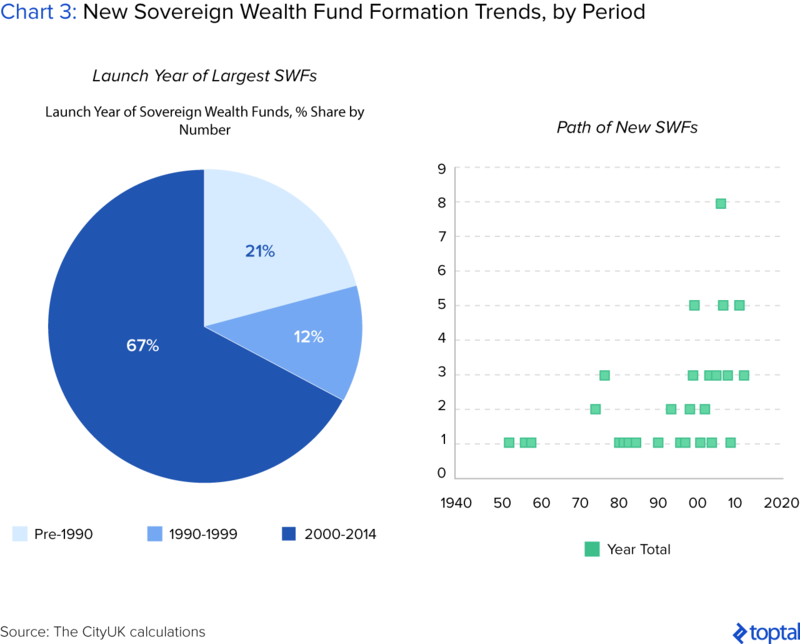 Since their formal arrival on the investment scene in the 2000s, sovereign wealth funds (SWFs) have been met with a healthy mix of curiosity and trepidation. Fair enough. After all, they exist somewhere between the murky grey of return-maximizing, mega-cap asset managers, and clandestine government agencies quietly used to further sovereign agendas. Cases in point: Was their mass rescue of the West’s banks—Citi, Merrill Lynch, UBS, and Morgan Stanley—during the 2008 financial crisis a collective investment in search of alpha or an exercise in geopolitical opportunism? Are China Investment Corporation’s African Infrastructure-for-Resources deals about non-renewable resource security or about geopolitical influence? Conspiracy theories and geopolitical checkmates aside, SWFs are without a doubt now mainstays of the global investment landscape. As an asset class, they have grown exponentially in size, number, and relevance, as reflected by their ballooning AUM, currently pegged at $7.4 trillion, and the scope, scale, and sophistication of their deals. Assessed as pure-play asset managers, SWFs are heterogeneous in investment objectives, which in turn drives their investment behavior, portfolio mixes, and success measures. This article introduces its readers to sovereign wealth funds as an asset class, its “categories of purpose,” investment strategies, and trends, as well as its ever-evolving allocation strategies. A Sovereign Wealth Fund is a state-owned investment vehicle established to channel balance of payments surpluses, official foreign currency operations, proceeds of privatizations, government transfer payments, fiscal surpluses, and/or receipts from resource exports, into global investments on behalf of sovereigns and in the advance of goals. SWFs invest both in real and financial assets, ranging from stocks, bonds, real estate, precious metals, and hard infrastructure, to alternative investments such as private equity, hedge funds, and venture funds. 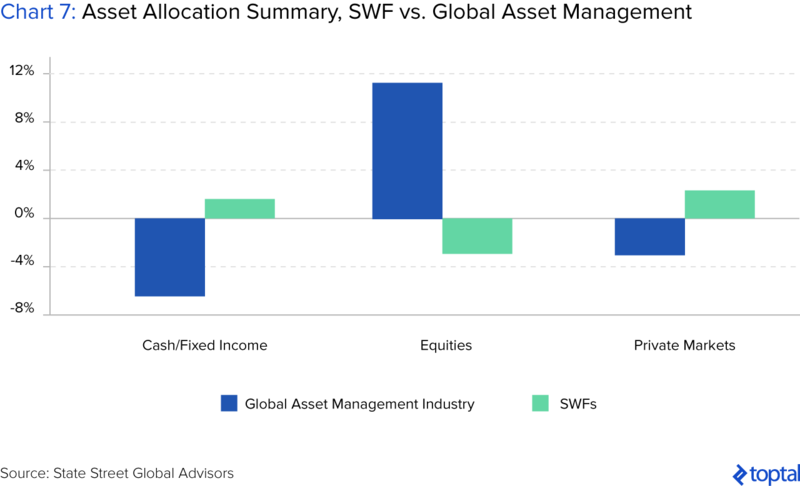 Though SWFs are principally global in outlook, they also invest domestically, especially where strategic development sovereign wealth funds are concerned. As of 2017, it is estimated that SWFs combined to hold more than $7.4 trillion in AUM, representing approximately 6% of global assets under institutional management. The vast majority of sovereign wealth funds are domiciled either in oil exporting countries or East Asia. Thus, and from a capital sourcing perspective, SWFs fall into two categories: (1) commodity sovereign funds, and (2) non-commodity sovereign funds. Commodity SWFs are financed from the proceeds of non-renewable commodity exports (oil, gas, precious metals), which grow the AUM base in times of high prices but destabilize their source economies and budgets in times of low. Non-commodity funds, on the other hand, are typically financed from currency reserves or current account surpluses, driven by corporate or household saving rates. Economic theory wise, it is important to understand that SWFs form part of their respective country’s total national capital base, where total national capital is defined as the total combination of net financial assets, total physical capital stock (e.g., real estate, machines, infrastructure), unexploited environment, human capital, and unexploited natural resources. Using an oil nation as an example, and leaning on Hartwick’s Rule for zero-sum intergenerational equity, extracting and selling non-renewable resources depletes one’s national capital base, unless the cash receipts are fully reinvested into one of the above financial, physical, environmental, or human capital stock factors. Thus, and ignoring superficial currency reserve math, actual savings would be net negative for oil nations unless their exhaustible resources are fully reinvested. It was in line with this logic that the world’s oil-rich countries first began to birth the early SWFs. The first SWF originated in 1953 as a constructive investment outlet for countries with budgetary surpluses and surplus export incomes. The first of its kind was the Kuwait Investment Authority (KIA), established to both invest Kuwait’s excess crude-oil revenues and diversify the nation away from its single resource dependence. Two years later, the Republic of Kiribati, a sovereign state in the central Pacific Ocean, created the world’s second SWF—the Revenue Equalization Reserve Fund—to hold and grow its foreign currency reserves. Little new activity took place until 1976, 1981, and 1990 respectively, when Abu Dhabi’s Investment Authority, Singapore’s Government Investment Corporation, and Norway’s Government Pension Fund were established. Since then, the size and number of sovereign wealth funds has exploded to over 120 sovereign wealth funds today, but with heavy asset concentration. 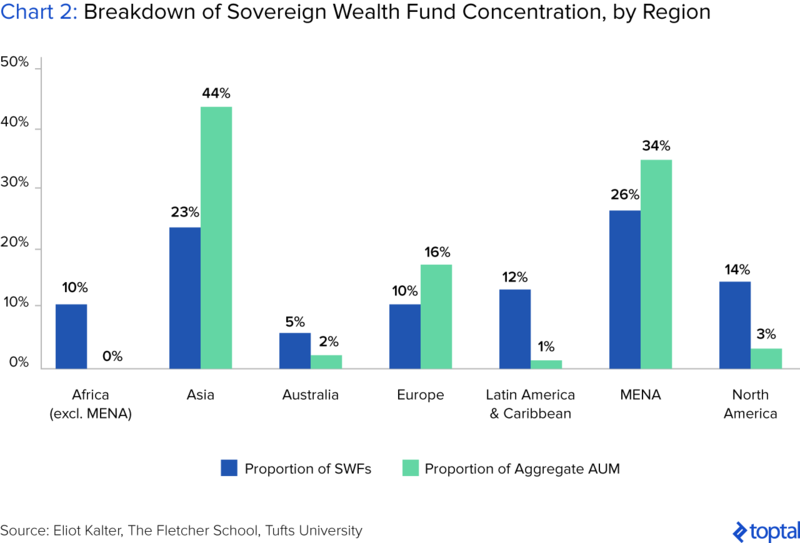 Specifically, the top 10 SWFs control 80% of total SWF AUM globally, and the top 20 SWFs control 90%, with China and Singapore controlling five of the ten largest sovereign wealth pools. All SWFs are similar in source and form but are heterogeneous in purpose, often mirroring their source country’s circumstances, policy priorities and liability structures. There are three broad priority categories most often pushed by sovereigns onto their wealth funds: (1) economic stabilization, (2) capital maximization, and (3) strategic development. 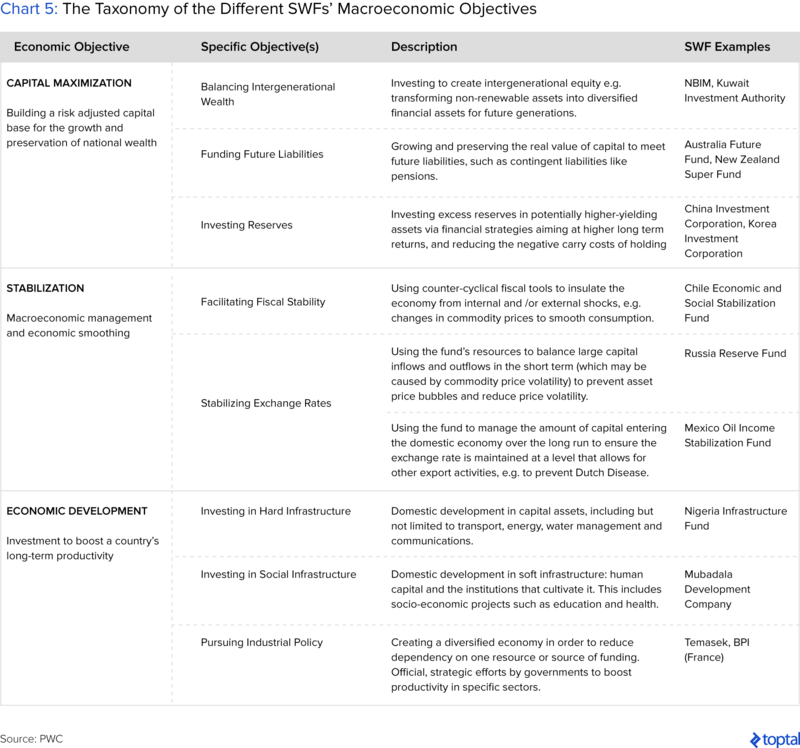 In turn, five broad classes of SWFs exist to actualize these agendas: (1) stabilization funds (stabilization priority), (2) savings and future generations funds (capital maximization priority), (3) pensions reserve and other future liabilities funds (capital maximization priority), (4) reserve investment funds (capital maximization priority), and (5) strategic development sovereign wealth funds (strategic development priority). I will expound on both the “three broad priority categories” and the “five broad classes of SWF” in greater detail over the course of the article, beginning with the latter. Stabilization funds: Also referred to as “rainy day funds,” stabilization funds are counter-cyclical fiscal tools established to insulate/smooth economies from internal and external economic shocks. Such shocks include commodity peaks and troughs (most acute in petroleum nations) and global and domestic economic boom-bust cycles. Russia, for example, is a big oil and gas exporter with an effective oil stabilization fund. Its mandate is to mitigate the impact to domestic budgets and exchange rates from downswings brought about by periods of low oil and gas prices. Savings and future generation funds: These are funds established to create intergenerational equity, saving and wealth transfers by converting non-renewable natural resources into more sustainable and “longer-duration” financial assets. The United States’ Alaska Permanent Fund and Canada’s Alberta Heritage Savings Trust Fund are examples of two returns-generating savings and future generation funds. Pensions reserve and other future liabilities funds: Pension reserve funds are designed to support the monetary needs of a given country’s social welfare and public pensions systems, especially in environments characterized by growing elderly populations and low birth rates (i.e., shrinking labor forces). Japan’s Government Pension Investment Fund (GPIF) is one of the largest and most effective of such funds, at $1.1 trillion in assets. Pensions are just one form of future public liabilities, and thus pension reserve funds are just one form of the broader category of future liabilities funds. At the highest possible level, future liabilities funds are in the business of preserving the real value of capital to meet future, contingent liabilities. Reserve investment funds: Reserve investment funds, as different from the other funds, explicitly manage a portion of, or all of, a nation’s foreign reserves. Their investment strategies involve investing in higher-yielding, long term assets, with a secondary mandate of reducing the negative carry costs associated with holding reserves. The China Investment Corporation and the Government of Singapore Investment Corporation (GIC) are two of the largest of such global SWFs with $813 billion and $360 billion under management respectively. Strategic development sovereign wealth funds (SDSWFs): These are SWFs used to further strategic, economic and/or national development priorities while generating a positive risk-adjusted return on their allocations. Such goals might include developing hard or soft infrastructure domestically (e.g., transport, waste, and energy infrastructure, or making job-creating investments), pursuing industrial policies of economic diversification especially in single-commodity economies, or implementing resource utilization mandates whereby SWFs acquire direct stakes in global firms to guarantee offtake of strategic domestic resources. 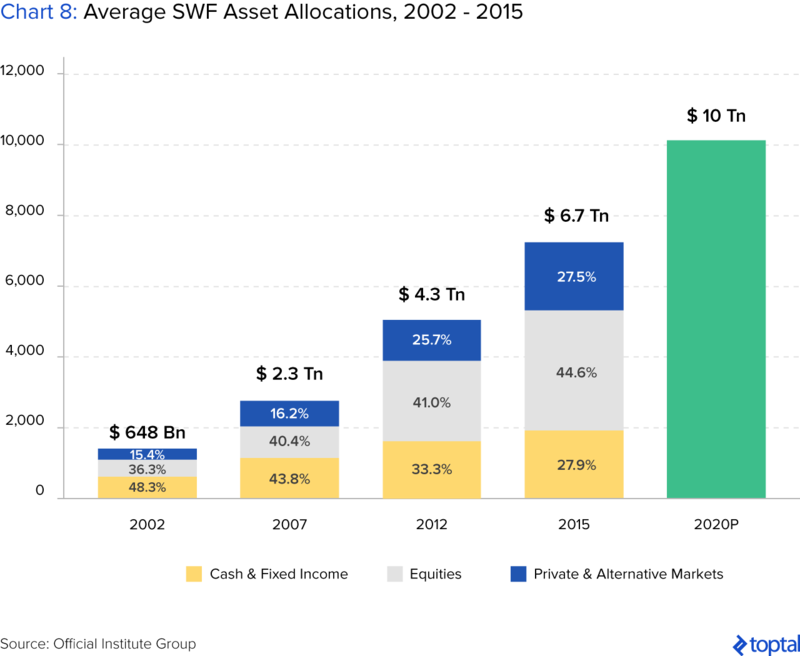 Since the asset class’ establishment in the early 2000s, the total AUM controlled by SWFs has grown at a compounded annual growth rate of 20%, from $650 billion in 2002 to $7.4 trillion (as of 2017). This growth has stemmed from a combination of investment returns, but more so from balance of payments surpluses and commodity export proceeds that swelled during the commodity supercycle and China’s boom years. Historically, SWFs have invested in four asset categories: (1) cash and equivalents; (2) fixed-income securities; (3) global equities; and (4) private markets, which included alternative asset classes such as real estate, infrastructure, and private equity/direct investing. Stabilization funds are specifically mandated to insulate their home economies from macroeconomic shocks and smooth their home government’s revenue streams. Thus, these funds tend to have short investment horizons and high liquidity orientations given the need to provide liquidity on short notice. These parameters largely limit the investable universe of stabilization funds to cash and equivalents, short and long-dated bonds, and money market instruments (fixed-income securities), with appropriate currency hedges to match potential liabilities. Traditionally, stabilization funds invested 15% of their capital in global equities, 40% in cash and equivalents, and the difference in low-risk, fixed-income instruments (see Chart 6 for a graphical illustration). Capital maximization funds, comprised of savings and intergenerational funds, pension reserve, and other future liability funds, are on the extreme end of the “returns maximization” continuum. They have transgenerational time horizons and are mandated to be of the most risk-seeking of the SWF types. Their portfolio allocations thus tend to overweight toward global equities and alternative investment classes aggressively in pursuit of alpha. 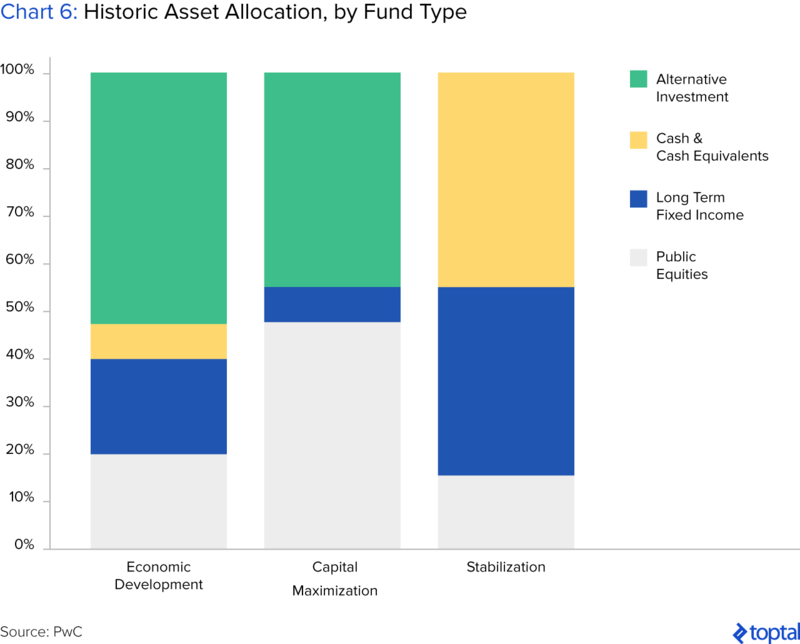 Traditionally, capital maximization funds typically invested about 10% in fixed income securities, and 40% and 50% respectively in alternative investments and public equities. Finally, SDSWFs, whose mandates include such priorities as social development, economic diversification, and domestic infrastructure fortification, tend to invest up to 50% of their assets domestically, with the difference globally spread across fixed income securities, public equities and cash equivalents, and private market investments. Though not an “economic priority” category, it is worth noting that SWFs across the board have also tended toward contrarianism, specifically trending counter-cyclically to prevailing market sentiment. The best examples of this are in their large investments into Western financial institutions in 2007/2008 when all other investors were fleeing banks, insurance, and specialty finance spaces. This trend is important as it has made many a deep-pocketed SWF “the financier of last resort” across a range of asset classes and nations. Most recently, the tech industry has been a net beneficiary of SWF capital injections with such high profile deals as Uber, Didi, Noon, Xiaomi and Jawbone, each of whom received lifelines or valuation reinforcement at critical junctures. In recent times, SWFs, alongside all others asset classes, have been faced with an atypical monetary environment. This environment, characterized by low interest rates, subdued inflationary pressures, depressed commodity prices, and low global growth rates, is one that has persisted despite quantitative easing and loose monetary policies. The result has been a marked shift in SWF portfolio allocations since 2007. The big trend in this respect has been a flight from traditional fixed income safe-havens (e.g., government bonds), toward riskier but higher returning equities and illiquid alternatives. Though this trend began in 2002, the 2007 crisis triggered an acceleration in the shift into alternative assets, with a material migration of allocations to private markets. And even despite the slight de-risking between 2012 and 2014, two thirds of assets remain invested in higher-risk assets, with public equities continuing to be the single largest asset class. State Street Global Advisors, the investment management and research division of State Street Corp. (the world’s third largest asset manager), posits three reasons for this shift. The first is that portfolio reallocations are the direct consequence of quantitative easing. Specifically, its report states that “the market cycle of zero-interest rate policies in the industrialized world has led to fixed income instruments holding lower utility for long-term investors” and thus a mass migration out. Second, the vast majority of the funds established since 2007 have been explicitly mandated to maximize returns, inducing some drift from low-yielding, fixed income securities. And third, longer vintage SWFs with more balanced mandates have, over the years, developed the institutional maturity and expertise to confidently venture into more unconventional asset classes. Further buttressing this point is the fact that the world’s largest SWFs are exhibiting a more pronounced reallocation shift than their smaller, newer vintage counterparts. This greater risk appetite can also be partially explained by the fact that larger funds can service any potential short-term liabilities comfortably from a proportionally lower cash/fixed income position than smaller funds. Looking to the future, sovereign wealth funds continue to be preoccupied with four global megatrends. The first, according to market research, in this instance conducted by Price Waterhouse Cooper, is “demographic” and “social” in nature. Specifically, by the year 2030, 300 million of the 1.2 billion expected population increase is predicted to come from those aged 60 and above. This reality poses material contingent liability, pension, and social security challenges for countries in both the developed and the developing worlds. The second megatrend is urbanization. Currently, 1.5 million people are being added to the global urban population every week, already placing enormous strain on existing infrastructure, especially in the less economically developed nations. By 2030, it is estimated that 5 billion people will live in urban areas, up from 3.6 billion today. As of the authoring of this article, twelve SWFs had been explicitly created in Africa for purposes of hard and soft infrastructure development, with five more expected to be established by 2020. Further, half of all funds state that they have an economic development objective that includes bolstering hard infrastructure, from roadways and low-cost residential housing units, to telecommunications and power infrastructure. The third megatrend involves the reshuffling of the current global powers. By 2040, seven of the world’s 12 largest economies will be current emerging market nations; these economies, coined the E7, include: China, India, Brazil, Mexico, Russia, Indonesia, and Turkey. The final megatrend is around climate change and the coming resource scarcity. According to peak oil theory, which, granted, was first proposed in 1950 and has so far proved unfounded, the earth has approximately fifty years of supply left in proven reserves. If true, this reality will have major implications for commodity economies, their future generations, and their place in the global arena. The emergence of sovereign wealth funds has been an important development for international capital markets and the investment landscape. As an asset class, it is poised and positioned to grow not just in AUM, but also in significance and influence in the years to come. Despite familiar fears, concerns, and usual suspicions routinely thrown around from one sovereign to the next, SWFs have continued to demonstrate their value and place globally, from their rescue of the West’s most prominent banks—Citi, Merrill Lynch, UBS, and Morgan Stanley—during the mortgage crisis of 2008, to their more recent investments in tech and renewables. With the establishment of the Santiago Principles, 24 generally accepted principles and practices voluntarily endorsed by the members of the International Forum of Sovereign Wealth Funds (IFSWF) to promote transparency, good governance, accountability, and prudent investment practices, the SWF asset class has a bright and high-impact future, with the world at large as its net beneficiary. Awesome detailed article on wealth. <a href="http://djvsoft.com/">Read this </a> link http://djvsoft.com/!